At the weekend, I took myself on a little day trip to Stockport. This may sound a bit of a duff place for a day trip; no beach, no massive shopping centre and no discernible culinary treats. But for me, it was paradise as I was off to Hat Works! 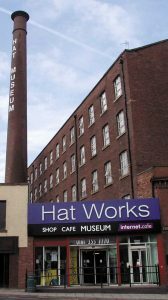 Stockport is a hidden gem with lots of social history museums (Staircase House, The Air Raid Shelters, Bramall Hall) but my destination was Hat Works, the UK’s only museum dedicated to the hatting industry, headwear and hats. Stockport, once the hub of hatting in the British Empire, kept not only the well-heeled properly attired, but everyone else on every social level in-between. However, things weren’t always exactly pleasant for workers in the industrial era. The town attracted the attention of Karl Marx, who even visited to write about its dreadful working conditions. At Hat Works, you can see a recreation of a worker’s cottage as well as see, hear and smell just a few of their machines running…when the factories were running at full-tilt it must have been terrifying! However, upstairs, it’s haven of peace where you can find yourself surrounded by beauty…such a contrast! With displays of hats with historical and cultural significance as well as a rolling exhibition of contemporary millinery, it’s a great place to just soak in the prettiness. My destination though, having experienced all the rest before, was the workshop space behind the cafe. I was there to take part in an Open Blocking Session and to gain access to some of the museum’s huge collection of hat blocks, both vintage and contemporary. I’d also signed up for a trouble-shooting millinery tutorial with the museum’s resident tutors Sue Carter and Marie Thornton. As Sue was my former tutor from Leeds College of Art and Design, I couldn’t wait to have a good gossip with her about hats, life and more. You can see why this was going to be such fabulous day for me! I can honestly say Hat Works didn’t disappoint. Look at the sight that greeted me when I arrived! So many blocks, so little time…. 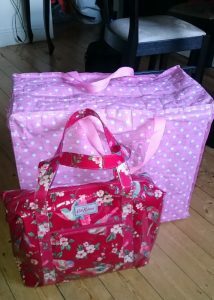 I had come well prepared for my day with a big bag packed full of sinamay, straw and some pre-stiffened felt. However, I had no plan for what I was going to do; I was totally at the mercy of the blocks and wouldn’t know what I was doing until I got there. That was a bit of a struggle for me, as anyone who has met me will know, I do like a plan! Spontaneity is, unfortunately, not one of my strong points. But I very quickly hatched a plan when I spotted some of the newer blocks on offer. Knowing which maker these blocks had been sourced from, but not having had the funds to take a punt on buying blind, this was perfect. I could now try before I bought! Not something which is usually available when it comes to buying hat blocks. As they are a serious financial commitment and investment, this was a super opportunity. To make the most of the few hours available to me, I decided to use sinamay for the first one. I knew this would dry quickly, even if it would take longer to build the three layers of material up individually rather than using a felt hood….so I set to work. This sloped beret shape is not dissimilar to a block I already own, but it is somewhat shallower and less bulbous. For my next project piece I decided to shift to a straw. I found this as part of a massive studio tidy up last month and it seemed like the perfect choice for this simple button. Again, I do have a button block, but this one is bigger than my current block. I decided to use the straw off-centre to maximise the starburst effect and offer as much of the straw to sew the decoration into. There’s also a few tools of the trade in this shot! With just enough time for one more block so for my final project of the day I had to choose one of the vintage blocks on offer. This is a fabulous 60’s pillbox and when blocked, didn’t look dissimilar to the one worn here by Jackie O. One of the other attendees blocked it in a gorgeous bottle green fur felt and it looked delish! However, I wanted to focus on the dimple in the middle of the hat to create a more contemporary shape…so again I cracked on with getting my three layers of sinamay on as swiftly as possible. Once it was dry, I trimmed things to make them a bit more even…but there is still a bit of a wobble in the edge! However, I will be re-cutting the edge of this even shorter and I won’t be rushing in the same way I was at the end of the day. I left Hat Works with a great feeling of achievement and a bag full of exciting goodies…even if I didn’t use half of the materials I had taken with me! I’d like to offer my enormous thanks to the lovely Bronwen who lead our blocking session. She was fabulous and made sure everything ran smoothly and that we all got the very best out of the day. A huge thank you to Sue and Marie for their, as ever, brilliant advice with a few other projects I was having technical niggles with. 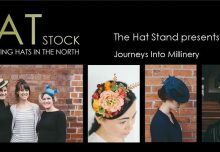 I really hope I’ll be able to make it to one of their Hat Chats in Huddersfield over Summer. 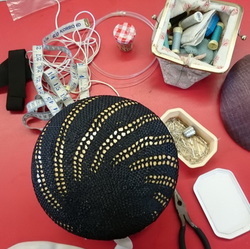 If you would like to try out the workshops at Hat Works, check out the full listings on their site. Be sure to sign up for the newsletter too, the next program is currently in progress and it sounds very exciting!